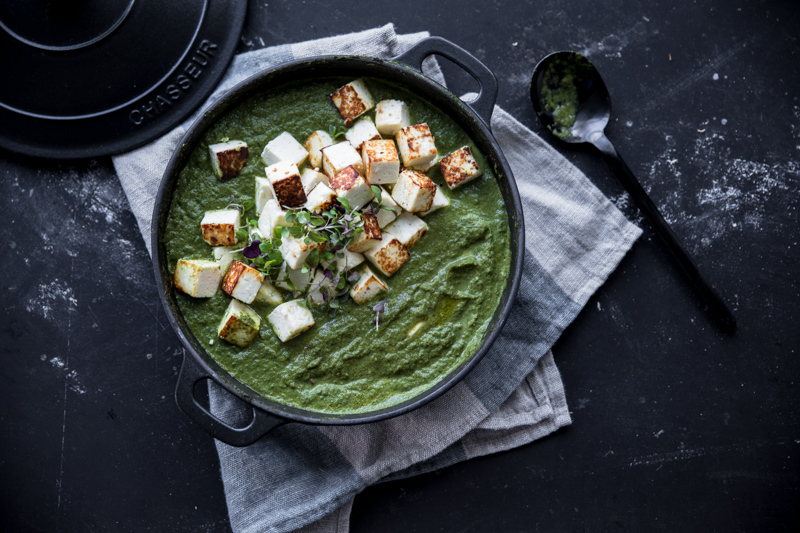 Create the most authentic and delicious version of the famous Indian vego curry – Palak Paneer, but with a twist! Using kale! A gorgeous, silky green weeknight option for a quick family meal, Kale Paneer can be frozen and easily packed in lunch boxes for a nutritious work lunch. We are a regular Popeye family. Spinach features heavily in our meals. From daals and curries to pastas and one pan meals. Palak Paneer was one of my most favourite meal while growing up. I have made several versions of it over the years based on all the different variations I have sampled in different eateries. But the silky smooth sauce of the traditional version cradling the most delectable cubes of golden fried paneer has my heart. With smoky garlic undertones, this is the version most likely to be found in good restaurants across India and is actually quite a cinch to make. It is in fact, my go to recipe when inspiration and time are both lacking. To enable this quick meal as a back up, I always make sure I have two packs of frozen spinach in my freezer and two packs of fresh paneer from the deli in my fridge. These ingredients are so routine that they don’t even need to be on a shopping list, I automatically head for them as I stroll through the aisles at the supermarket. A testament to the number of times this dish gets made at home. After making the age old Palak Paneer for the umpteenth time, as I leafed through the pages of my cookbook for dinner inspiration; I had an epiphany. In my cookbook, I have a recipe for Kale And Spinach Soup. 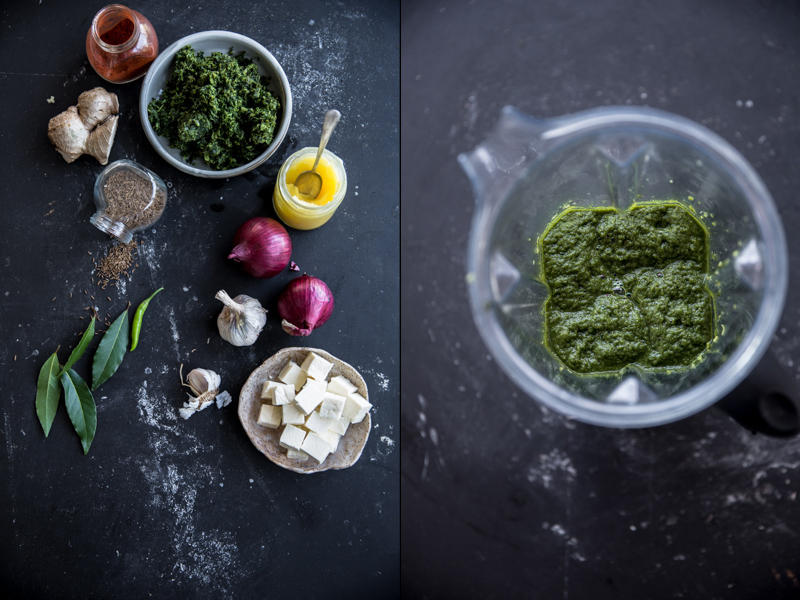 Why not give the good old Palak Paneer a fabulously modern twist and make it with kale? It was about time the bunnies stopped having the fresh bunches of kale I bought for them every week. We deserved full access to those green leafy bouquets as well. So I started making Kale Paneer instead and quite frankly, they both taste very similar. The spinach version tends to be silkier (because obviously spinach is a more delicate leaf) while the kale version seems to be nuttier and more smoky. My local supermarket has started stocking packs of chopped frozen kale. So these tend to get picked up at my weekly shop as well. Most of the time, I will add the paneer cubes unadulterated. But occasionally, I’ll pan fry them in a bit of ghee till they start turning golden and the dish will instantly acquire a wow factor both in looks and taste. The trick to getting a silky smooth sauce is first steaming the greens briefly before pulverising in a blender. This breaks down their fibrous structure. 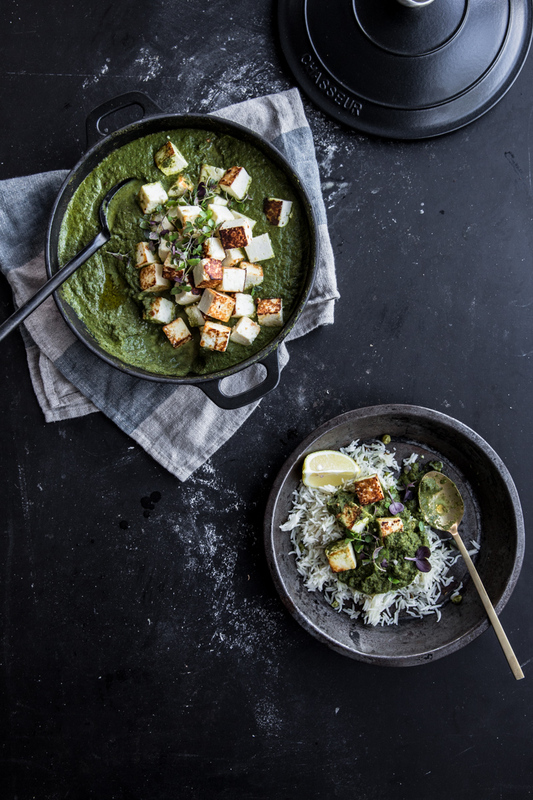 A delicious, nutritious and easy weeknight meal option, Kale Paneer is a fabulously modern take on the famous Indian vegetarian dish – Palak Paneer. Can be made with fresh or frozen kale. The curry freezes well and transports beautifully for work lunches. Fill a large saucepan with water about 3cm deep. Place a steaming insert/steamer basket inside the saucepan making sure it doesn’t touch the water. Place frozen kale on the steamer basket, cover and steam on high for approximately 8 minutes until kale is a shade darker and looks a bit wilted. Remove from heat and cool slightly. 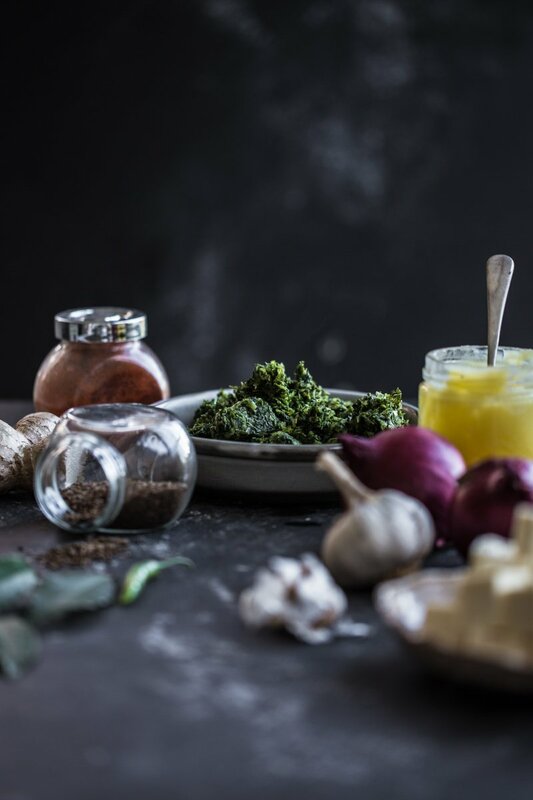 Place steamed kale, onion, garlic, ginger and chili in the jug of a blender along with 1 cup of water. Blend for a couple of minutes until silky smooth. Set aside. Heat ghee in a sauté pan or small wok on medium. Add the cumin seeds and bay leaf. Fry for a few seconds until starting to sizzle and spurt. Slowly add the kale purée to the hot pan. Reduce heat to low and cook while stirring gently and occasionally for approximately 10 minutes. Add ground cumin, garam masala, chili powder and salt. Mix well and cook for another 10 minutes. If the sauce starts to feel a bit dry, add a quarter cup water to loosen it. Add cream and paneer. Mix well. Cook for a further 3-4 minutes until cream is well incorporated and warmed through. Remove from heat. Garnish with herbs. Serve hot with a knob of butter along with steamed rice or naan. For a golden paneer option pan fry paneer in a bit of ghee in a wide frying pan on medium heat, tossing constantly. At any time towards the end of the cooking process or after, if you feel the sauce is getting too thick or stodgy then loosen it with 1/4 cup water. I usually make Palak tofu, but I’ve never thought about using kale instead of spinach…it’s an easy but brilliant substitution!! I just discovered your blog today through ig. I love it! I am in aw with your photographes. So incredible beautiful. I read your post on blogging and stopping with the events you organise. Maybe you can use the blog for teaching people how to make stylish pictures? Less energy absorbing than a life class I would think. I certainly would love to read about it, but I will follow you from now on no matter what you write about! Quite Innovative recipe.. The pictures are so good. doesnt Kale taste more bitter in pureed form? But I guess spices and onions balances the taste. Got to try it! Cheers Sapana! Actually it doesn’t. You are right about the spices but the gentle steaming in the first step takes away the bitterness. Raw kale is bitter but when cooked down, loses its sharpness quite a bit. How to adapt this for fresh kale? Thanks!